We are just about to announce that we have got left-handed hitter Marlon Anderson from Nationals with cash considerations for rookie-level pitcher Jhonny Nunez. Anderson, 32, is a veteran of nine Major League seasons, compiling a .264 lifetime average with 52 homers and 318 RBI. In 196 career pinch-hit at-bats, Anderson has a .296 average (57 hits), including seven homers and 29 RBI. He was a member of the 2004 National League Champion Cardinals, appeared in four games in the 2004 World Series with the Cardinals. For tomorrow, we’re going to recall Matt Kemp and James Loney and purchase the contract of Einar Diaz. All three will be in uniform for the game. David Wells has gone to San Diego, so you can all calm down with the crack pipe references. Also, check out Tommy Lasorda’s new posting on his blog. Tomorrow, we’ll be honoring Don Newcombe for the 50th anniversary of his MVP/Cy Young season in 1956. And you did it! This year, the paid attendance at Dodger Stadium will be greater than ever before. Quite impressive — and the pennant race should keep this place hopping for all of September and hopefully all of October. Quite a game last night. We left here around 1 a.m. and it was truly something cool to watch. In fact, we looked into it this morning and at no point in the 116-year history of the Dodgers have they hit a leadoff homer and walk-off homer in the same game. Lots of David Wells rumors out there and I’m sorry to say I haven’t asked Ned if they’re true or not. I can’t be of much help there. He’s got enough to do than worry about me chirping in his ear. For the Spanish-speakers (are there any of you on here? ), check out the front page feature on Maddux in today’s La Opinion. It’s very cool. Also, check out Tom Hoffarth’s blog on the Daily News. He took advantage of the Pavilion Party Pack, which has its last one on Sept. 21. That’s all-you-can-eat Dodger Dogs, nachos, peanuts, popcorn, Cokes and water, plus your ticket, for $35. More information is here. We just got back from a hospital visit with J.D. Drew and Nomar Garciaparra, as they spent time with some kids in the pediatric ward at White Memorial Medical Center. J.D. had actually visited the same hospital last year when he first signed with the team and while he couldn’t return to the Dodgers’ Pediatric Playroom because it’s being retro-fitted, it was nice to see that a few of the people working at the hospital remembered him from his last visit. On this, the one-year anniversary of Hurricane Katrina, visits like this certainly give us all a reason to think about the lives of others less fortunate, though we shouldn’t really need these sorts of reminders to do so. Still, I think everyone that took part in the hospital visit – players, front office and media – got a healthy dose of reality again today and the kids got a few famous visitors to brighten their day. As promised, here are the game notes with the Beatles’ theme. DRIVE MY CAR – Dodger second baseman Jeff Kent drove in his 1,371st career RBI yesterday to tie him for 70th place on the all-time list with Lave Cross, who played from 1887-1907. Chili Davis is next with 1,372, followed by Johnny Bench (1,376). Kent ranks 76th on the all-time homer list with 343 and he currently has a season-high six-game hitting streak. TICKET TO RIDE – The Dodgers will pass the three-million mark in paid attendance tonight, the 21st time in club history they have reached that milestone and the 11th consecutive season they have hit that plateau. The club is on pace to set a single-season attendance record, topping the 3,608,881 fans that attended games at Dodger Stadium in 1982. THREE COOL CATS – Rafael Furcal’s triple yesterday was the Dodgers’ Major League-leading 45th, more than doubling their 2005 total (21). The club is paced by Kenny Lofton (9), Andre Ethier (7) and Furcal (7) who are all vying to become the first Dodger since Brett Butler in 1993 to hit 10 triples in a season. The Dodger franchise record for triples in a season is held by George Treadway, who hit 22 in 1894. Willie Davis holds the Los Angeles record after legging-out 16 triples in 1970. That 1970 club hit an LA Dodger record 67 triples. THE LONG AND WINDING ROAD – Following their win yesterday, the Dodgers are 18-7 in the month of August on the heels of a 9-17 July mark. The club record for wins in the month of August is 20, set by the 1983 Dodgers. Los Angeles is two shy of that mark with three games to play. EIGHT DAYS A WEEK – The Dodgers finished the month of August undefeated on Saturdays and Sundays (8-0). WE CAN WORK IT OUT – Since July 28, the Dodger pitching staff has a 21-7 record, tied for the best mark in the Majors. Their 3.22 ERA is the best in baseball and they’ve allowed just 21 home runs, the least in the Majors (STATS, LLC). RUN FOR YOUR LIFE – Rafael Furcal ranks ninth in the NL with 90 runs and is vying to become the first Dodger leadoff batter to score more than 100 runs since 1991, when Brett Butler had 112. At Dodger Stadium, Furcal is batting .301 (129-for-428) and since May 1, he is hitting .303 (131-for-433) with 72 runs scored. WITH A LITTLE HELP FROM MY FRIENDS – Dodger starter Brad Penny is seeking his career-high tying 14th victory tonight. Penny has received 5.63 runs of support per game, the 10th-highest mark in the National League, according to STATS, LLC. He has a 15-8 career record in 32 games at Dodger Stadium with a 3.25 ERA (70 ER/193.2 IP). HEY JUDE – Dodger closer Takashi Saito picked up his 16th save in 18 chances yesterday, pitching for the third consecutive day. Saito is five saves shy of Yhency Brazoban’s Dodger rookie record of 21, set last season. Steve Howe ranks second on that list with 17 saves in 1980. COME TOGETHER – Since July 27, the Dodger bullpen has gone 6-2 with 11 saves in 14 chances, 81 strikeouts and a 3.34 ERA (33 ER/89.0 IP). During that stretch, Brett Tomko, Takashi Saito and Jonathan Broxton have combined to go 6-0 with 11 saves and a 1.81 ERA (9 ER/44.2 IP). Dodger relievers have struck out 370 batters on the season, which is third-best in the National League and have held batters to a .252 average, yielding just 399 hits in 418.1 innings pitched. I’LL BE BACK – N.L. Comeback Player of the Year candidate Nomar Garciaparra ranks sixth in the National League with a .321 average this year and second with a .433 average against left-handers. He is seventh with a .363 average with runners in scoring position and has 24 RBI that have put the Dodgers ahead in a game, tying him for the seventh-most in the NL. Aramis Ramirez leads the NL with 28 go-ahead RBI. Nomar is also the toughest player in the Majors to strike out. HOLD ME TIGHT – The Dodgers have won four of their last five one-run games and are 14-16 in such contests. They’ve won 12 of their last 19 one-run games after starting out 2-9. TILL THERE WAS YOU – Before Greg Maddux joined the Dodgers, the team’s ERA was 4.45 (465 ER/941.0 IP). Since then, it is 3.46 (83 ER/215.2 IP), lowering the club’s overall mark to 4.22, fourth-best in the NL behind San Diego (4.08), New York (4.09) and Colorado (4.17). I WANT TO HOLD YOUR HAND – Tomorrow at White Memorial Medical Center, Nomar Garciaparra and J.D. Drew will spend time visiting with youngsters in the pediatric unit from 11:30 a.m. – 12:30 p.m.. The hospital is located at 1720 Cesar E. Chavez Ave. IN MY LIFE – Former Dodger farmhand Chris Michalak makes his Dodger Stadium debut tonight, six years after posting a career-high 11 victories for the Dodgers’ Triple-A affiliate in Albuquerque. In 2000, Michalak went 11-3 for the Dukes, ranking third in the Pacific Coast League in wins. Forty years ago today, the Beatles played a concert at Dodger Stadium in front of 45,000 fans. 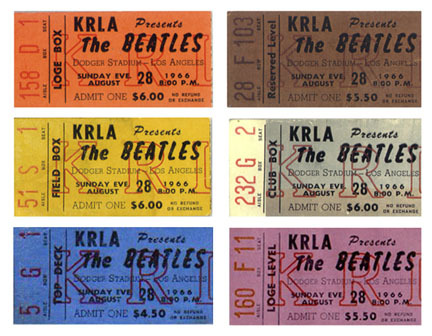 It marked the second-to-last concert ever for the famous band. The most expensive seat in the house was $6 and amazingly, Dodger tickets can still be purchased for that amount four decades later. In honor of the anniversary, the music at tonight’s game will be all Beatles selections. The game notes will also have a Beatles theme and I’ll post them in a bit when I get the lineup. Tom Hoffarth of the Daily News blogs about the concert in far better detail that I have and it’s definitely worth checking out. I’m not sure what the problem was yesterday with the posts. If it continues, please let me know and I"ll have someone at MLBAM check into it. Tough loss last night, but on the bright side, we’re still in first. We missed a chance to gain a game on the Pads and they missed a chance to pick one up on us. Today, we recalled Tim Hamulack and optioned Giovanni Carrara for assignment.